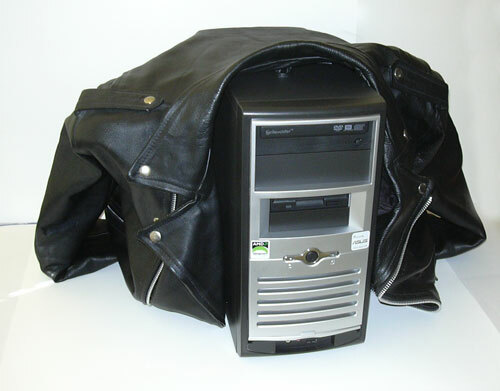 No, he didn't come with a Black Leather Jacket, but he's so much cooler than Mr. PC was, he just looks like he should wear one. I found it a little freaky just how easy it was to get him running. Finding the Ethernet cord took the most time, the rest was just plugging in peripherals and powering him up. And he boots fast. Mr. PC was still in Win98SE, and he had a lot of thinking to do before he could have the desktop ready. Even Mr. Laptop is slow in comparison. Douglas (yes, he seems to have taken well to that name and resisted efforts to accept a new one) is like a greyhound. Point him in a direction and VOOM!, he's there, waiting for the next instruction. Of course, it still took all day to get him set up. The Belmont Computer people did copy most of the folders I needed into a backup folder, so moving data to My Documents folder was easy enough. Getting all the email folders took a while, and still isn't done. Outlook Express is kinda stupid when it comes to how it saves the Address Book when you have multiple Identities (which I do; the Dr. Eldritch email, evannichols email, and my Comcast email), so I had to do some cleaning out of Address Books once they were copied in. And I found my Bookmarks! They were in the backup file, so I don't have to recreate them! That made me happy. Then there was loading software. I gathered discs and ran installs. I downloaded my LJ client. I fired up Photoshop, and it warned me that it didn't know all the fonts I use, so I had to install the fonts. Then I copied over the images for Ask Dr. Eldritch. 1.4GB of them! Fortunately, I got a 1GB flash drive, which made it easier to move all the photos and images for the comic. There's still a little touch-up to do, but I just about have everything that was on Mr. PC and all the new/changed files from Mr. Laptop merged together onto Douglas. I also have to decide if I want to get Microsoft Office. They preloaded him with Open Office, which is free, but I haven't tested out whether the word processor and spreadsheet programs will do what I need/want them to do, or if I have to have MS Word and Excel for that. And I wouldn't mind having Publisher, either. Now it's time to go to Todai with drarwenchicken, because IT'S HER BIRTHDAY! Mmmm, Birthday Sushi!